The Flowers are sorted A-Z by their botanical name. If you want to find a flower using the common name, please use the search box above. Agastache 'Astello Indigo' is just about the most exciting breakthrough yet and it's got the award to prove it - Europe's coveted Fleuroselect Gold Medal. Compact and quick growing, they flower in the first year from seed with fabulous, upright spikes that are fully covered with deep indigo-blue flowers. The masses of fragrant blooms throughout the summer are ideal for cutting. They produce copious amounts of nectar for bees and butterflies to feast upon. 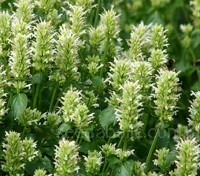 The latest introduction and additional colour in the series, Agastache ‘Asturo White’ feature spires of scented white flowers with fresh lime green spikes. Extremely long blooming, it will bloom the first year from seed, from mid-summer, right through autumn until first frosts. The plants are ideal for Northern European-type climates, at their best in more temperate conditions. A fabulous addition to beds and containers, for gravel gardens and wildlife borders. Originally bred by Brian Kabbes and developed in his nursery of ‘perennials and botanical rarities’, Agastache ‘Globetrotter’ has soft, touchable flower spikes that are lilac-pink with carmine-red bracts. Leaves used to decorate cakes, to make a tea or floated in drinks. Added to your Pimms lifts it to a higher sphere altogether. They must have one of the prettiest flowers of all this very pretty family. 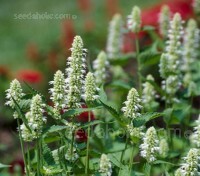 Agastache ‘Liquorice White’ has tall spikes of white lipped flowers and like all Agastache produces copious amounts of nectar for bees and butterflies to feast upon. Flowering late in the season, it is a boon for building up bees’ honey reserves before winter and will produce a honey surplus where drifts are grown. 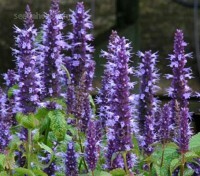 Agastache 'Liquorice Blue' has tall spikes of lavender to rich purpley blue lipped flowers, above toothed dark green arrow shaped foliage. When brushed past or crushed, the foliage emits a sweet liquorice perfume. 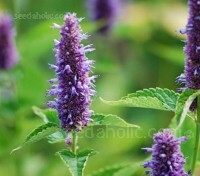 A wonderful plant for attracting bees and butterflies to the garden. 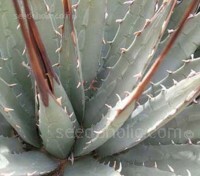 Agave mckelvyana is a small, relatively rare species of American Agave from western Arizona. This little beauty forms a tight rosette of broad, bluish green, fleshy leaves with small teeth. 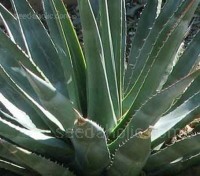 It is one of the hardiest agaves, it can take winter rain and is tolerant of drought and severe freezes to minus 15°C. New Mexico Agave, Parry’s Agave or Mescal Agave. 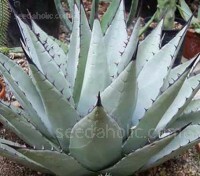 Agave parryi is a dramatic specimen that forms a compact rosette of bluish green leaves, heavily armed with dark tipped spines. Cold hardy to minus 18°C it will withstand snow and ice and has the ability to grow 60cm wide and as tall. This stylish succulent has long been highlighted in magazines and television shows. Agave utahensis is an uncommon plant, native to the dry limestone canyons of the Mojave Desert. The variety nevadensis is one of the smallest species and one of the most cold hardy, down to around minus 26°C. It is often used as feature plants in modern style landscapes. 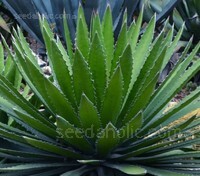 Agave xylonacantha 'Blue' is the beautiful blue-green leafed form. Rare in cultivation, this dramatic specimen is armed with the most bizarre large white teeth of all the family. One of its previous names, Agave carchariodonta was in reference to the teeth (odonta) of the Great White Shark, Carcharodon carcharias. Once a common sight, Corncockle bears large, soft purple-pink flowers in the summer. 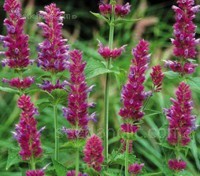 It is a 'cottage garden' plant of old and makes a great wildflower meadow or garden plant. The graceful stems are ideal for cutting and last well in the vase. 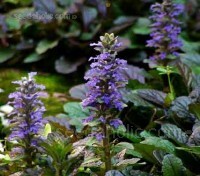 Ajuga genevensis is used throughout the world yet this relatively uncommon form is less well known. This very well behaved, evergreen groundcover has deep gentian blue flower spikes and is by far the showiest of the species. 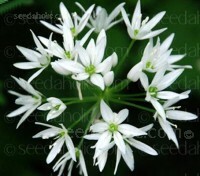 It is often the plant of choice for smaller areas or along edges and pathways. 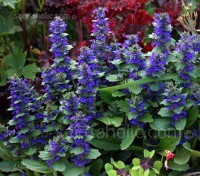 For most of the year Ajuga is a pleasant, quiet achiever, a very versatile low growing ground cover, with evergreen, rosette-like foliage that hugs the ground like an evergreen carpet but those weeks in spring when the blue flowers appear are simply quite magical. 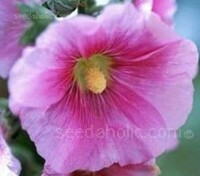 Alcea ficifolia is reliably perennial and unlike the biennial forms which produce a single spire, they produce many upright stems, resulting in a bushy form. ‘Happy Lights’ is a beautiful strain, a bold blend of white, pink, purple, red, and yellow blooms. If sown early they will bloom in their first year. 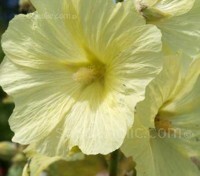 Alcea ficifolia is a lesser known perennial hollyhock species native to Siberia, it is a substantially more robust plant than the common hollyhock and unlike the biennial forms which produce a single spire, Alcea ficifolia produce many upright stems emerging from the base, resulting in a bushy form. 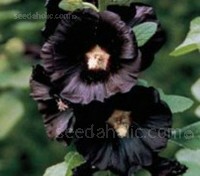 Alcea ficifolia is a most impressive plant, reliably perennial, it produces many upright stems resulting in a bushy form. The 'Henry Vlll' series is highly valued for its vigor and reliability, they produce huge, single butter-yellow, saucer shaped flowers that grow up to 15cm (6in) wide. 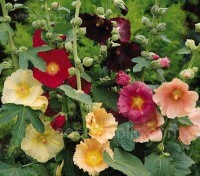 Alcea ficifolia is a less-known variety of hollyhock. Reliably perennial, with attractive palmate foliage, the plant produces many upright stems and has a bushy form. 'Single Mix' produces large, single saucer shaped flowers that appear from May to October in a gorgeous variety of shades - cream, gold, rose pink, copper and plum. ‘Chater’s Double’ give a wonderful mixed colour range of large, fully double flowers that are nearly pom-pom in appearance. Rosettes of big hairy leaves will develop by autumn then die back before winter. It will bloom the following summer .... the word bloom being an understatement! 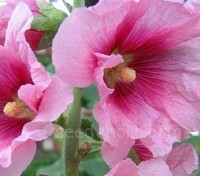 This gorgeous award winning Hollyhock has the distinction of being the shortest in the Alcea rosea family. 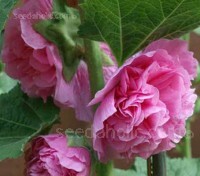 'Queeny' is a dwarf Hollyhock that reaches only 60cm in height with fully double blooms. 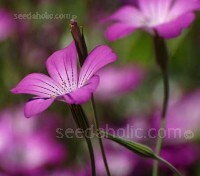 Unlike the tall varieties, it is a perennial that can also be used as an annual as it will bloom in its first year. 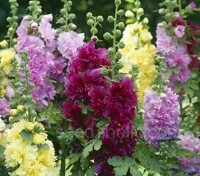 Hollyhocks are a mysterious and prolific flower with a long and rich history. Traditionally associated with cottage-style borders, the dramatic, near-black flowers of Nigra work equally well in a contemporary, minimalist garden. This unique variety creates an impressive impact against most backgrounds. 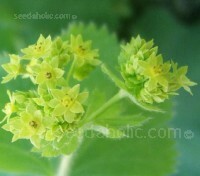 The unpretentious lady's mantle is extremely useful for both its foliage and its flowers. The foliage has the additional virtue of looking especially beautiful after a rain, when it holds water droplets in the pleats of its surface like many pearls of liquid mercury. This is a stunning fashionable plant, with globes of rosy-purple crowded spherical umbels, and strap shaped leaves. The flowers are very long lasting and help fill that awkward gap between the later spring bulbs and the perennials. 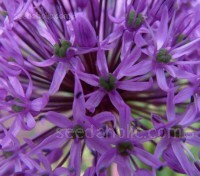 Allium connoisseurs will tell you this little-known Allium is the most beautiful of them all. They point to nodding clusters of delicate wavy-edged bells in soft shades of rose and lilac set above masses of slender grass-like glaucous foliage. 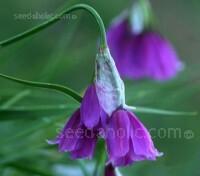 Allium narcissiflorum is one of the treasures of the genus. 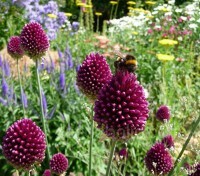 Allium sphaerocephalon is a quite unique, summer-flowering plant that prized by gardeners because of its striking floral display. The tall stems are good at adding colour and movement to the garden, they provide light vertical accents when drifted through borders.